Several years ago, this blog provided a summary of the guidelines for stopping upper gastrointestinal bleeding (All bleeding stops | gutsandgrowth). Most of the recommendations are unchanged. A nice review of this topic (L Laine. 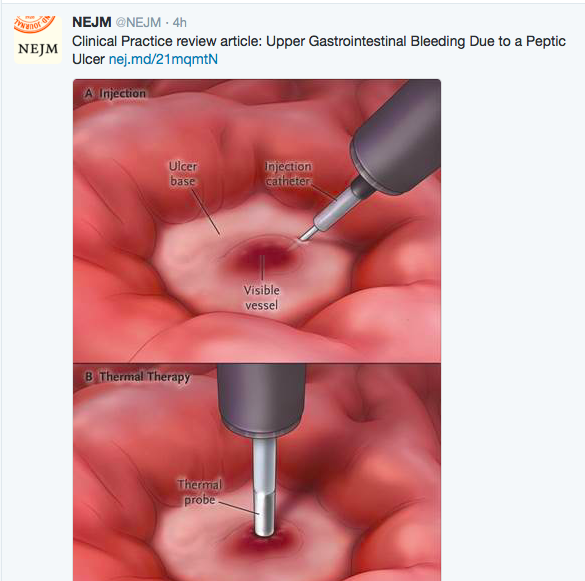 NEJM 2016; 374: 2367-76), specifically focused on peptic ulcers, provides a few new pointers. Proton pump inhibitors. “A recent meta-analysis showed that intermittent oral or intravenous proton-pump inhibitor therapy results in outcomes that were non inferior to those after continuous infusion.” (JAMA Intern Med 2014; 174: 1755-62) For adults, the suggested dosing was 80 mg followed by 40 to 80 mg twice daily for 72 hours. As before, the author recommends preoperative (30 min prior) erythromycin (250 mg) and states that a nasogastric tube in not needed. The author also recommends that in patients with idiopathic ulcers (not due to NSAIDs or H pylori) that ongoing (indefinite) use of once-daily maintenance therapy with a proton-pump inhibitor is recommended to prevent rebleeding. This entry was posted in Gastroenterology and tagged idiopathic ulcers, peptic ulcers, proton pump inhibitor therapy by gutsandgrowth. Bookmark the permalink.